Solar Retinopathy: What may happen when you look at the solar eclipse without eye protection? By reading this article, your agree that you have read the disclaimer at the end of this article, and agree with its contents in their entirety. As we know, looking at the solar eclipse without any eye protection is extremely dangerous, with the possibility of permanent eye damage. It can potentially cause solar retinopathy. So if you did peek at the eclipse yesterday, even for a teeny bit of time, how do you know if there is a problem with your eye/s? According to Eyewiki, solar retinopathy (also known as photic retinopathy, foveomacular retinitis, solar retinitis, and eclipse retinopathy) refers to a photochemical toxicity and resultant injury to retinal tissues, usually occurring at the fovea. 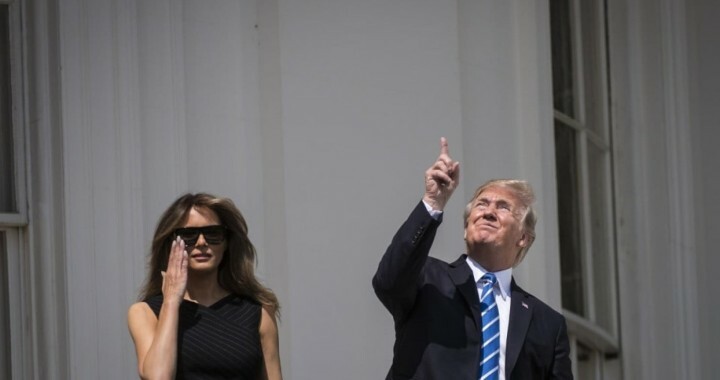 This entity is commonly associated with sun-gazing or eclipse viewing, and often results in mild-to-moderate visual acuity deficit and/or central or paracentral scotomata. Recovery is spontaneous in nature and occurs over the course of 3-6 months after the inciting event, though visual recovery may be incomplete and patient may suffer from permanent visual acuity deficits and central or paracentral scotomata. While this disease process is routinely associated with gazing at the sun and looking at a solar eclipse , it can also happen in other situations such as while using welding arcs without proper protection (welder’s retinopathy), or with pointing laser pointers to the eyes. According to Drs. Martin A. Mainster & Patricia L. Turner, retinal damage appears to occur primarily due to photochemical injury rather than thermal injury. The temperature rise from looking at the sun with a 3-mm pupil only causes a 4°C increase in temperature, insufficient to photocoagulate. The energy is still phototoxic: since light promotes oxidation, chemical reactions occur in the exposed tissues with unbonded oxygen molecules. Histopathalogic analysis in animal eyes after prolonged light exposure helped characterize the histopathologic changes observed in solar other photoxic retinopathies. 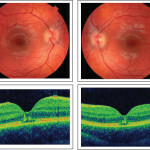 As early as day 2 post-exposure, major changes were observed mainly in and about the retinal pigmented epithelium (RPE). 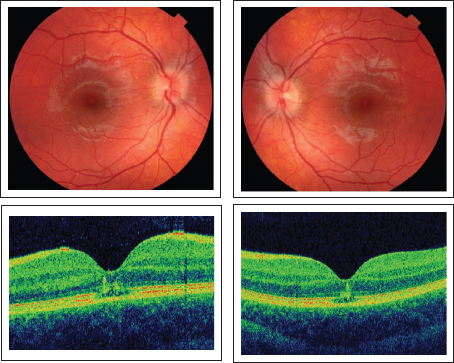 RPE disruption was evident throughout the exposed area, sometimes associated with choroidal damage. Pigmentary changes of the RPE were noted as macrophages were observed engulfing melanosomes in the subretinal space. Resolution of these findings can be seen by 10 days after injury. In a study in a human eye, a 65 year-old man scheduled for enucleation for choroidal melanoma agreed to stare into the sun 6 days prior to enucleation. Findings included photoreceptor changes including vesiculation and fragmentation of photoreceptor lamellae, the presence of whirls within disc membranes, mitochondrial swelling and nuclear pyknosis. Retinal Pigment epithelial cells in the affected area showed plasma membrane changes, smooth endoplasmic reticulum swelling, and changes in lipofuscin granule structure. How does an ophthalmologist or an optometrist diagnose solar retinopathy? Visual acuity check – Vision may be normal in some; in others it may reduce to 20/100. This vision loss is typically reversible, lasting in some cases for about a one month to over one year in some other cases. Patient complaints (symptoms) may include visual impairment within hours of exposure, with blurry vision, dark spots in the field of vision (central or paracentral scooters). Additional complaints may include color vision impairment (dyschromatopsia), distorted vision (metamorphopsia), objects appear smaller (micropsia) or headache. Fluorescein angiogram (FA) – usually not advised these days, though it may show window defects. In a study, FA did not detect lesions characteristic of solar retinopathy in all patients with a definitive history of sungazing and visual loss, compared to OCT.
Optical Coherence Tomography (OCT) – usually indicated to study retinal structure and damage. Findings may include changes and disruption at the level of the sub-foveal RPE and outer retina; rest of the retina appears normal. So what do you do now? If you have looked at the sun during the solar eclipse, and you have experienced blurring of vision in either (or both) of the eyes since, you may do yourself some good by seeking an expert opinion. Do remember that our brain tends to overcome visual impairment in one eye by overriding it with the information from the other eye. Hence it is important for you to check your vision in each eye, separately. How do you do that? Sit in a place that is adequately lighted, and focus on an object about 6 feet away. Preferably, this object should be multicolored. Now close one eye with a magazine or the palm of your hand, without pressing on the eye, and look at this object with the other open eye. Reverse the process. Repeat the test. If you do not see the object clearly from either eye, or both, or the colors appears fuzzy, it might make sense for you to seek an opinion. Another test that can be done at home is called Amsler grid. In this test, the person focuses on the small dot in the center of the grid, with each eye separately. The grid is held or kept at a reading distance. It may be possible that people who may have solar retinopathy may see a black spot, wavy lines or some missing lines in the grid. If you observe any of these results with your test, please repeat the test once more to confirm the findings before you rush out the door. Note: It is pertinent to remember that experts may not see any changes in your retina if and when you decide to go for a test. Even if you have gazed at the solar eclipse without proper eye protection, it is possible your eye/s may not develop any symptoms and/or signs of solar retinopathy. In others, changes in solar retinopathy sometimes appear very subtle, and/or may appear only later. In some other cases, you may have another (possibly undiagnosed) that may be pre-existing (and/or not related to solar retinopathy) – it could be a coincidence that you find out about the eye condition after the above-mentioned self test, or after a visit to an expert. DISCLAIMER: This above referenced information is being provided for the public good, without any claim for its accuracy and/or completeness. Any diagnosis of a condition in the eye requires sophisticated equipment for evaluating the eye/s. Accordingly, you agree that you will not completely rely on the contents of the above referenced article as a diagnosis of the medical condition, as a confirmation of the medical diagnosis, or as a medical recommendation for yourself and/or anyone else, including but not limited to your family and/or friend/s. In light of the above, you acknowledge that you have read the above referenced post in its entirety, including this disclaimer, and agree that if you have, or suspect that you have, a health problem, serious or otherwise, you will consult with your health care provider immediately, based on your own judgement and decision, and not primarily on the basis of having read the above referenced article. Posted in Disease, Management and tagged Amsler grid, Solar Eclipse, Solar Retinopathy.